The forum drew a strong crowd of IT professionals from all across Australia for a full day of technical and business sessions. There were multiple plenary and sessions from the leaders at Veeam's USA and Australian headquarters - including Veeam Co-CEO Peter McKay, Vice President of Enterprise Strategy Dave Russell along with some local Australians - Global Technologist Anthony Spiteri and Cloud and Hosting Manager Alan Warmington. In between sessions, participants networked and engaged with some of the Sponsor booths from select Australian Partners. Probax were a proud silver sponsor of this forum; which engaged over 600 IT experts and visionaries throughout the day. 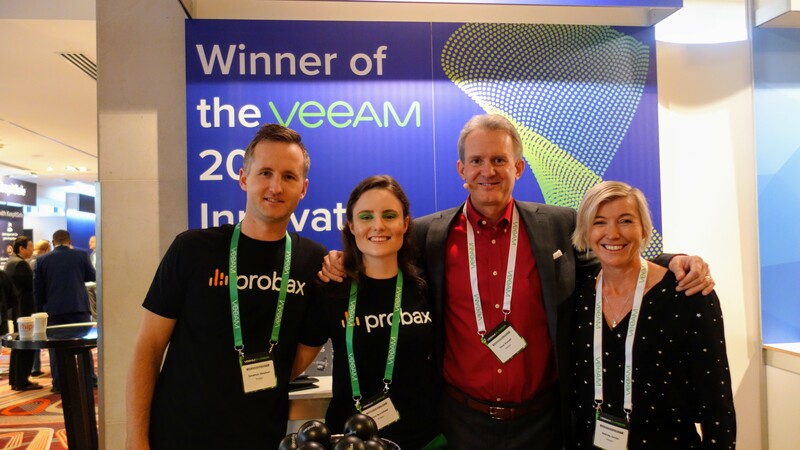 VeeamON Sydney was a fantastic opportunity to share Probax's innovative, Veeam-powered solutions; the recently launched Backup for Office 365 and our global award-winning Honeycomb Virtual Tape Libary (Archive as a Service). With much excitement surrounding the launch of Veeam's expanded Office 365 solution to include SharePoint and OneDrive, Probax is committed to delivering this update to our valued channel customers in the near future. VeeamON Sydney was capped off by a lively networking function which included a Sponsor Raffle Prize (Congratulations, Roger Goult!) and flashmob musicians. We're already looking forward to 2019 and being a part of Australia's leading availability event! Pictured (L - R): Probax Channel Manager Jonathan Sheahan, Marketing Executive Anna Burchfield, Veeam VP of Enterprise Strategy Dave Russell and Veeam Channel Sales Manager Belinda Jurisic.